You may view and acquire more than 4000 different posters by artists such as Hans Arp or Andy Warhol, from Marc Chagall to Pablo Picasso. 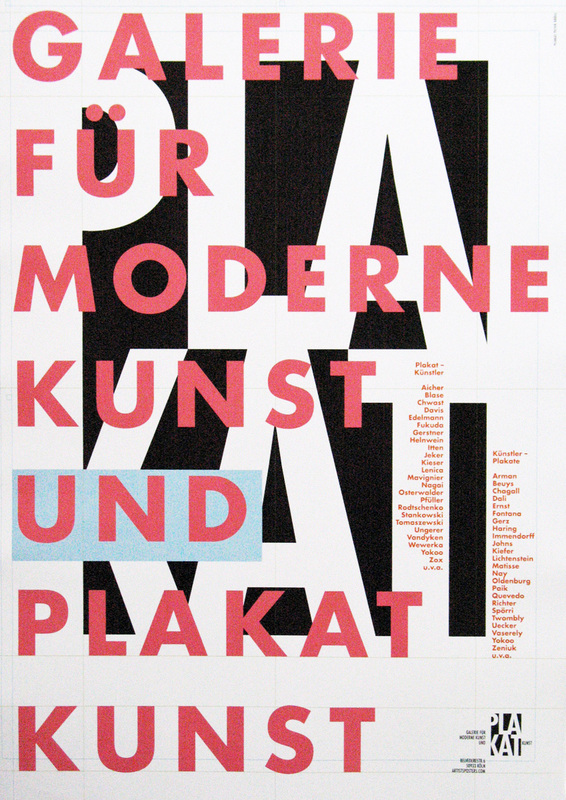 More than two hundred different artists designed the posters themselves, mainly for their own exhibitions. Our gallery has been a specialist for such artists' posters for more than 40 years. Find out more about the characteristics of the artists' posters below! Are you looking for posters connected with a particular artist? Then enter the name of the artist in the "Fast Search" space. Are you looking for posters connected with a specific subject such as sport or the Olympic Games? Then click on one of the Search Criteria listed in the index! A Full Text Search enables you to search according to unusual criteria such as places, titles or the names of galleries. Would you prefer to conduct your search by flicking through a catalogue at your leisure rather than sitting in front of a monitor? Then send for our catalogue with more than 1500 colour illustrations. You still have the possibility of checking online the availability of the posters at a later date! You can also visit our gallery! You will find us in 50859 Köln-Lövenich, Kölner Str.60. We are easy to reach, both by public transport, Bus 144, stop Dieselstr. and by car. There are no problems with parking! Posters and graphics are dispatched in special, protective packaging. In the interests of our customers we also see to it that the delivery is done at a reasonable cost. The artist poster was designed in the main by an artist with an advertising intent and lays claim to having an artistic character. These posters - in the vast majority of the cases they announce a forthcoming exhibition of the artist in question - denote a link in which free art meets and merges with applied art. In these cases it is appropriate to speak of an original draft by the artist of his own poster.